They sound yummy, Charlotte. I like the idea of just using dill stems in the mix but I’m not sure why. Is it for extra crunch or because you’re going to be sprinkling with the leaves later? And was it a palaver separating the two? For crunch and intensity of flavour, but also I hate throwing them away. I think I am actually becoming my Aunty Pat. No palaver at all, it’s just the base end of the dill, I didn’t separate anything – just chopped the bunch in half crosswise, if you know what I mean. And I use most of the dill leaves in the yoghurty dollopy thing. Am I understanding your question, or have I gone bonkers in this past week of writerly isolation by the sea…? Yep, you’ve got the question quite clearly, and answered it beautifully. I imagined some tedious stripping action rather than a swift, crosswise chop. I’m relieved to learn the truth as I am, as you know, no fan of the culinary palaver – unless of course it’s going to be fun. Yum yum yum. I’ve just cooked your patties for dinner (for 4) and we devoured them all. None left for the freezer. Thanks for a great recipe. I did the dill yoghurt too which was delicious, although I just did dill + yoghurt, keeping it simple for family fare. Loving your food. Ooh goody! So glad you liked ’em. I actually could probably eat the whole batch myself, but then I am a champion greedy pig. Okay, now I know where I went wrong. I am actually a good cook. 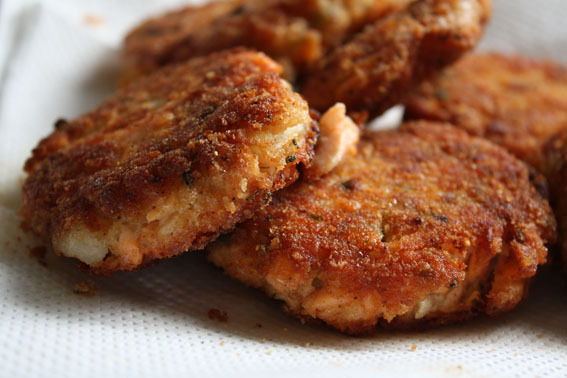 Nevertheless, when I tried to make salmon cakes (yet another name for these) I used (store bought) breadcrumbs in the filling, making them heavy, dense, and indigestable. I should have used potato. What was I thinking? I’m going to try again using your recipe. These are foolproof Grad, foolproof. Potato and egg, bingo. They are pretty hearty, though sort of nicely flaky if you get the spud/fish ratio right. And Lou that sounds damn fine. I thought you were talking about za-ataar (however do you spell that?) the other day, which I thought would be a bit too strong on the flavour front, but that sounds delish. You go to people’s houses and cook for them? Do drop by next time you’re in the neighbourhood, won’t you? These look and sound scrum-didly-umptious, Charlotte. Perfect springtime fare, too, with a nice big salad and a frosty glass of vino… mmmm…. When I started off cooking at the eager age of 10 years (greedy piglet from way back, I am) ‘salmon rissoles’ was part of my initial repertoire as taught by mum. 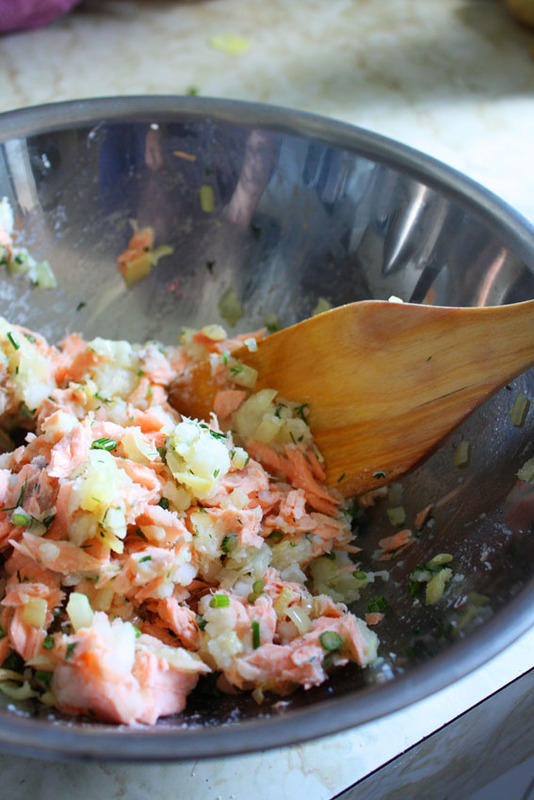 And with her salmon rissoles the potato, finely chopped onion and egg was the basis (along with tinned salmon, plus one or two more things). I still make my mum’s very simple recipe as comfort food, but I really like the sound of yours, Charlotte, so I’ll give that a try. By the way, I’m a great believer in chopping the dill the way you do, too. But it’s a bugger of a herb to grow – I’ve given up trying to maintain a steady supply – too fickle and quick to go seedy or just cark it.